New Renamo President Ossufo Momade. Maputo — Delegates to the congress of Mozambique's main opposition party, the former rebel movement Renamo, have elected Ossufo Momade, the interim coordinator of the Renamo Political Commission, as the Party's new President. He is the successor to Afonso Dhlakama who led Renamo from 1979 until his death from diabetes in May last year. Momade was appointed interim leader shortly after Dhlakama's death and, like Dhlakama, he opted to run Renamo from its military base in the central district of Gorongosa. The election of the new president was held on Wednesday night, and the Renamo electoral commission announced the results on Thursday morning. Momade coasted to an easy victory with 410 votes. His nearest rival, Elias Dhlakama, the younger brother of Afonso, won 238 votes. Thus the Dhlakama name, and the support he had from other members of the family, notably from his niece, Ivone Soares, who is head of the Renamo parliamentary group, was insufficient to defeat one of Renamo's most prominent generals. The other three candidates scored a derisory number of votes. Only five delegates voted for the Party's general secretary, Manuel Bissopo. This humiliating result may be related to Bissopo's poor showing in the October municipal elections. 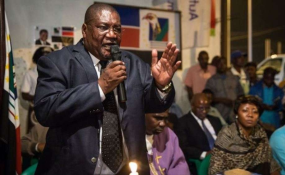 He headed the Renamo list of candidates for the Beira municipal assembly, but was defeated by both the Mozambique Democratic Movement (MDM) and by the ruling Frelimo Party. Renamo parliamentarian Juliano Picardo took five votes, and nobody at all voted for Herminio Morais, who was the unsuccessful Renamo candidate for mayor of Maputo in October. There were also two blank ballots and one invalid vote. Speaking to reporters, the Congress spokesperson, Jose Manteigas, said "the election took place in a calm atmosphere, in which all the delegates expressed their choice through the vote. It was a democratic procedure where the members showed what they wanted". The Congress will now elect a new general secretary, and a new Renamo National Council and Political Commission will be formed.